Safeguards your delicate electronics from blackouts, brownouts, power surges and line noise. 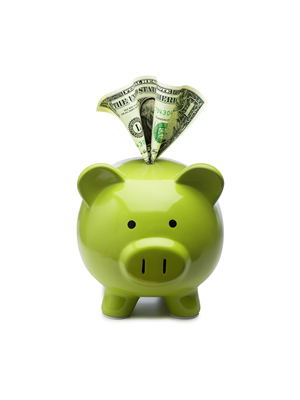 Includes 6 power outlets, including 3 with battery backup plus surge protection and 3 with surge protection only. Tripp Lite's SMART750USB line-interactive UPS system offers automatic voltage regulation, surge suppression and long lasting battery support. 750VA/450 watt power handling ability supports entry-level PCs, network workstations, point-of-sale equipment, small business phone systems, audio/video equipment and home theater systems. Internal UPS circuits support entry level PC systems for up to 45 minutes during power failures so that connected equipment can be shut down without data loss. Automatic Voltage Regulation (AVR) circuits regulate brownouts as low as 89 volts back to usable levels without using battery power. 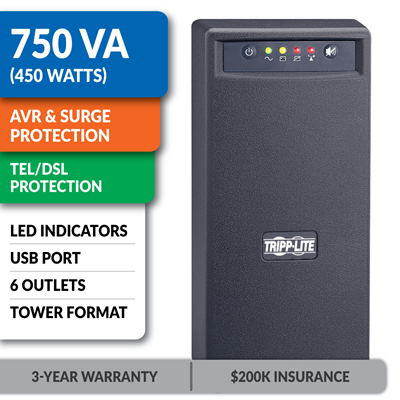 Offers complete desktop power protection in an attractive, black tower configuration. Includes 3 battery-supported outlets for computer, monitor and one vital system peripheral as well as 3 additional surge-only outlets for printers and other system accessories that do not require battery support. USB port (USB cable included) enables optional unattended system shutdown without data loss in the case of extended power failure. PowerAlert UPS monitoring software is available via free download. Built-in dataline protection jacks offer protection of a single dialup phone/DSL line or network Ethernet connection. Built-in audible alarm and 4 front panel LEDs indicate line power status, battery power status, battery low/replace status and voltage boost operation. Offers 2.2 minutes battery runtime with a full load of 750VA/450 watts and 8.3 minutes with a half load of 375VA/225 watts. Supports battery replacement via built-in access panel. Automatic Voltage Regulation (AVR) technology protects against damage and data-loss from brownouts. 510-joule surge suppression rating shields your components from unexpected power surges. Single-Computer Runtime: This UPS system will support an energy-efficient desktop computer and LCD monitor for up to 45 minutes during an outage. Half-Load Runtime: This UPS system will support a 50% load (225W) for up to 8.3 minutes.